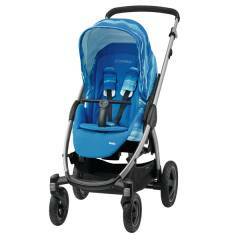 Go anywhere (and everywhere) with the Maxi-Cosi Stella from Maxi-Cosi Outlet. 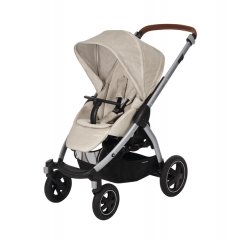 This smart, modern baby stroller is suitable from birth and easy to push. It has all-terrain wheels and a slim lightweight frame to capably tackle off-road tracks or narrow city streets and kerbs with ease. Your baby can face you or face forward to explore the world around them. It has a full recline position for a comfortable nap time on the go. And it can become a stylish travel system with the addition of a carrycot or Maxi-Cosi baby car seat. There are plenty of great features to make the Stella pushchair a welcoming space for your child. The cushioned seat is designed for your baby’s comfort during long walks. The sun canopy provides protection from bright sun, wind, and rain and has a handy viewing window. The shock absorbing tyres and rear wheel suspension keep the ride smooth. The T-bar can be removed to make it easy to put your child safely in place and take them out. And the seat cover can be removed and washed in the washing machine to keep it hygienically clean. 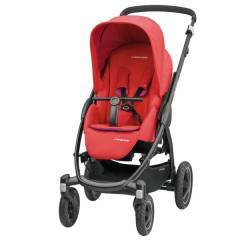 If you plan to use your pushchair a lot, it needs to be comfortable and practical to use. We’ve constructed the Stella with an adjustable handle so whoever is pushing can quickly achieve the right height for them. You can easily switch from fixed or swivel wheels to suit where you’re walking. There’s a large storage basket underneath for your nappy bag, handbag and other essentials. At the end of the walk, it folds quickly without you bending and it stands upright for easy storage. And you can even remove the seat for ultra-compact folding and transportation.